The Challenge: National guidelines recommend at least 60 minutes of moderate-to-vigorous physical activity every day for children and teens, but the majority of young people do not meet that goal. 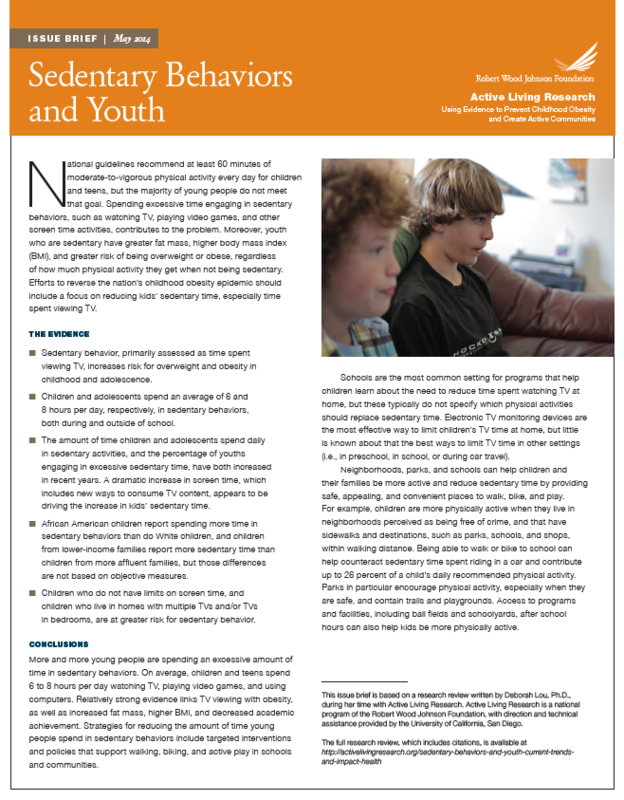 Spending excessive time engaging in sedentary behaviors, such as watching TV, playing video games, and other screen time activities, contributes to the problem. Make an impact: To prevent obesity and promote health among children, the American Academy of Pediatrics and other experts recommend a nutritious diet, regular physical activity, and limits on screen time, including TV viewing, video games, leisure-time computer use, and other screen-based activities that contribute to sedentary behaviors. What the findings are about: This research review examines trends in sedentary behaviors among youth and their impact on obesity. It also explores differences in the prevalence of sedentary behaviors based on age, gender, race, ethnicity, and socioeconomic status. Policy implications and future research needs are identified. Sedentary behavior, primarily assessed as time spent viewing TV, increases risk for overweight and obesity in childhood and adolescence. Children and adolescents spend an average of 6 and 8 hours per day, respectively, in sedentary behaviors, both during and outside of school. The amount of time children and adolescents spend daily in sedentary activities, and the percentage of youths engaging in excessive sedentary time, both increased in recent years. A dramatic increase in screen time, which includes new ways to consume TV content, appears to be driving the increase in kids’ sedentary time. African American children report spending more time in sedentary behaviors than do White children, and children from lower-income families report more sedentary time than children from more affluent families, but those disparities are not evident in studies based on objective measures. Older children and teens are more likely to spend more time in sedentary behaviors and to exceed recommended limits on sedentary time than younger children. The evidence on whether girls or boys are more sedentary is mixed. Objective data revealed teenage girls are more sedentary than teenage boys, but surveys indicated boys spend more time playing video games. Children who do not have limits on screen time and live in homes with multiple TVs and TVs in bedrooms are at greater risk for sedentary behavior. An abbreviated Issue Brief, Sedentary Behaviors and Youth (May 2014), is available that highlights the Research Review's main findings. 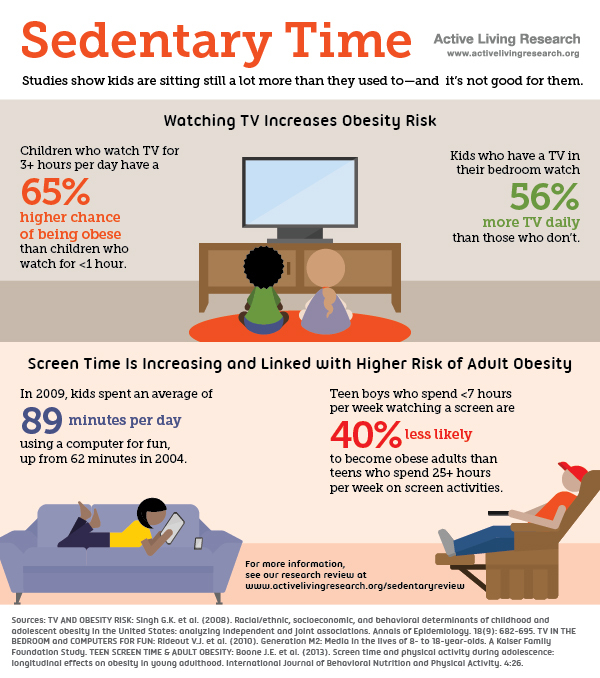 Findings presented in this brief are also available in the related Youth Sedentary Time infographic (September 2014). Lou, D. Sedentary Behaviors and Youth: Current Trends and the Impact on Health. San Diego, CA: Active Living Research; 2014. Available from: www.activelivingresearch.org.